On a squiggle level, looking at an LD down or a double three in progress. See charts. Month end. 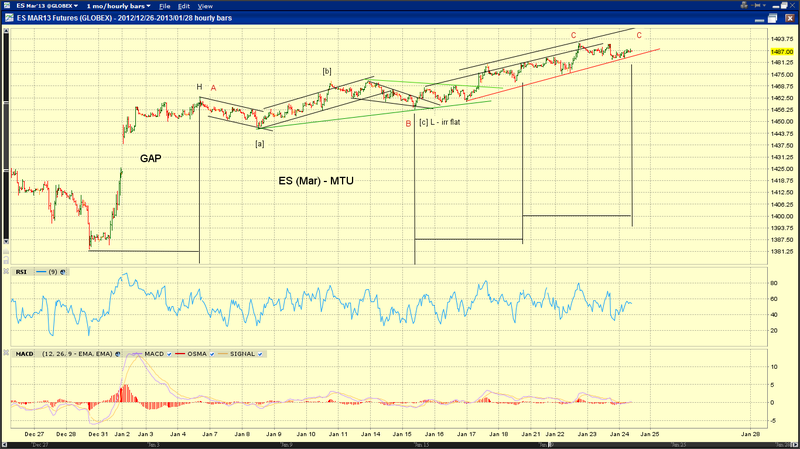 ES is making another attempt at the base channel. See chart. ADP, GDP and FOMC day. See chart. 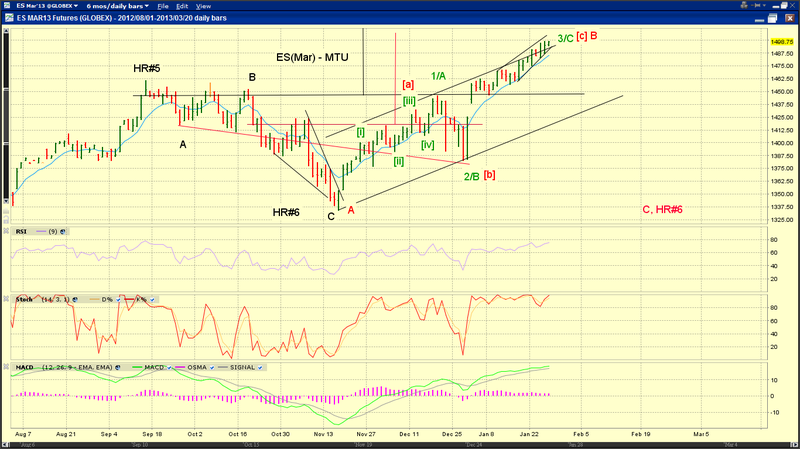 Potential post triangle thrust today (Chart 1). Possibility at larger degrees (Chart 2 and Chart 3). 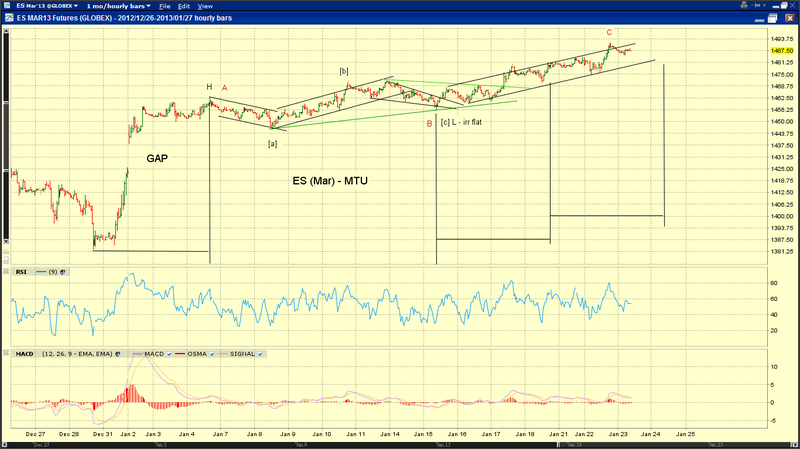 ES dipping back into the base channel. See chart. 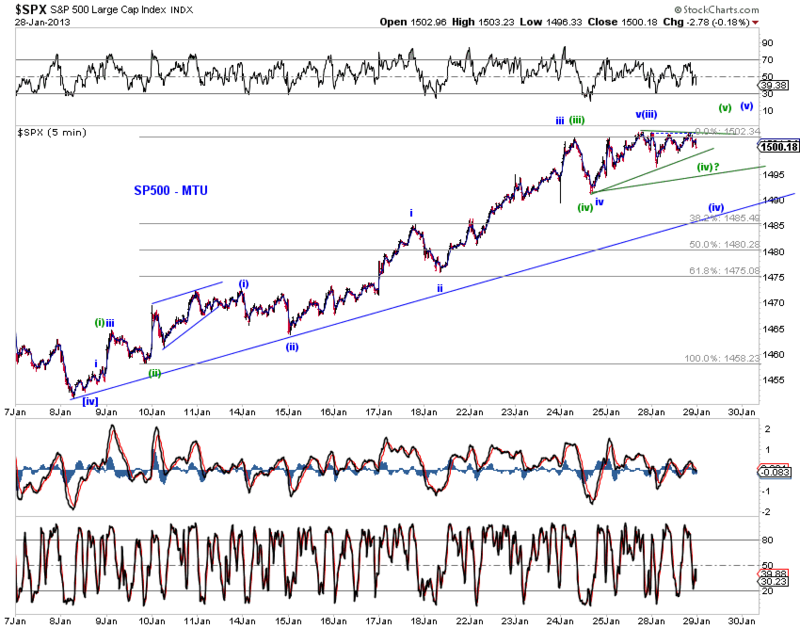 SPX squiggles count like a small degree bullish triangle at the moment (Chart 1 and Chart 2). 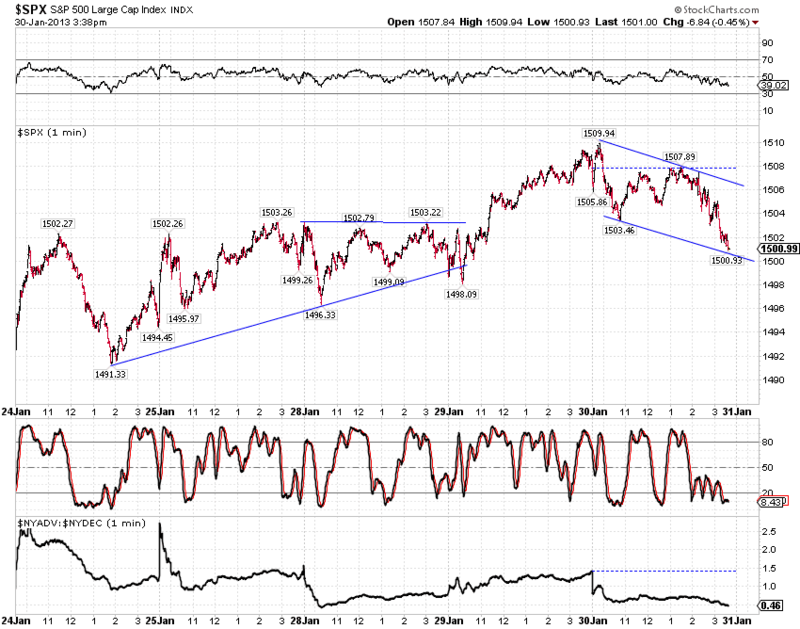 At the same time, beware of the bearish potential of a seemingly failed-triangle topping structure. See Triple Top (1/25/13) for discussions of near term and longer term assessment. 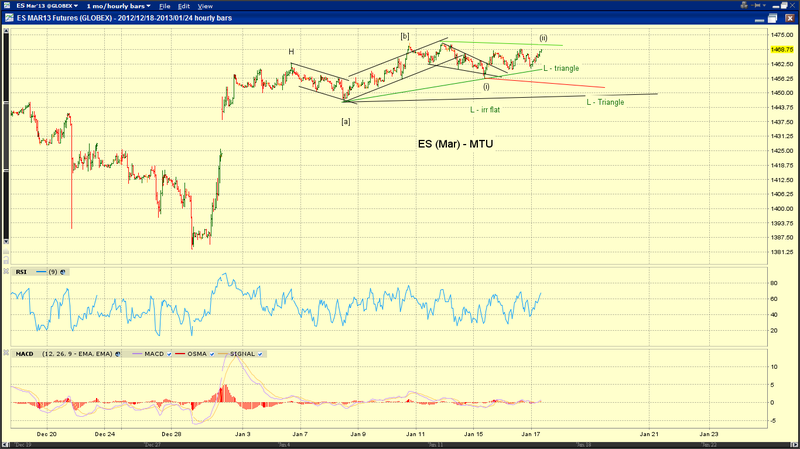 ES is approaching the small IHS measured target (red). 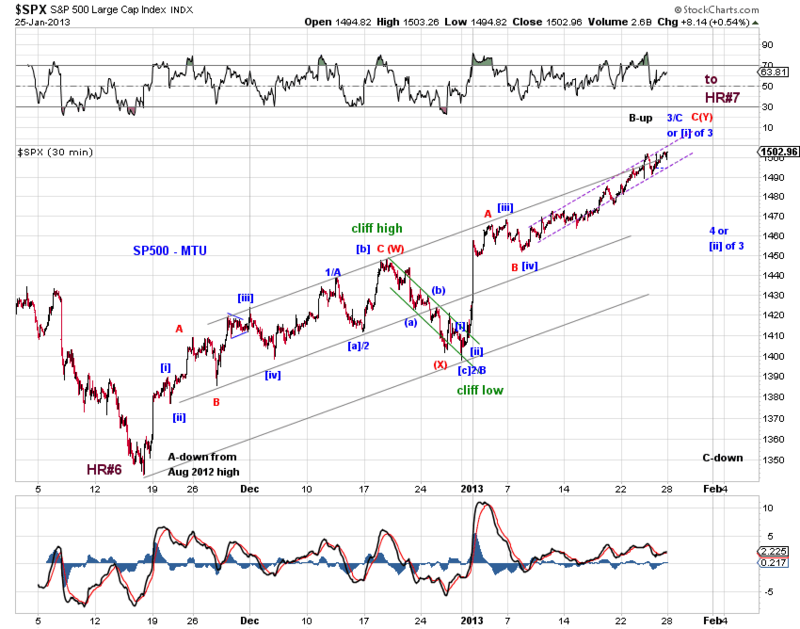 Also note the large IHS target. 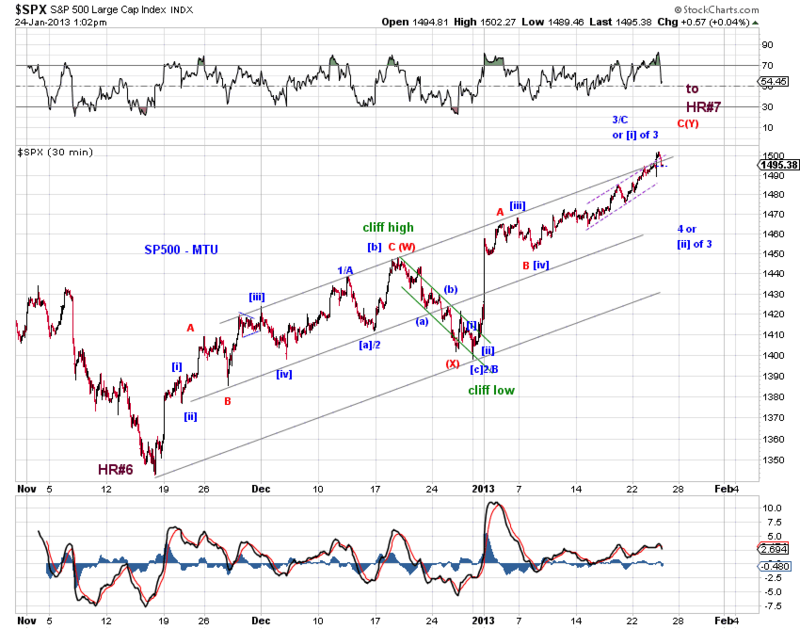 [blue] Wave 3 or wave [i] of 3 of the upswing from point 6 to point 7 of our Hope Rally model. 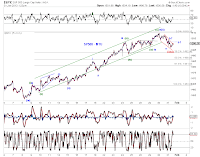 A wave 4 or wave [ii] of 3 retrace is in order, before further advances toward the end of the Hope Rally are seen. 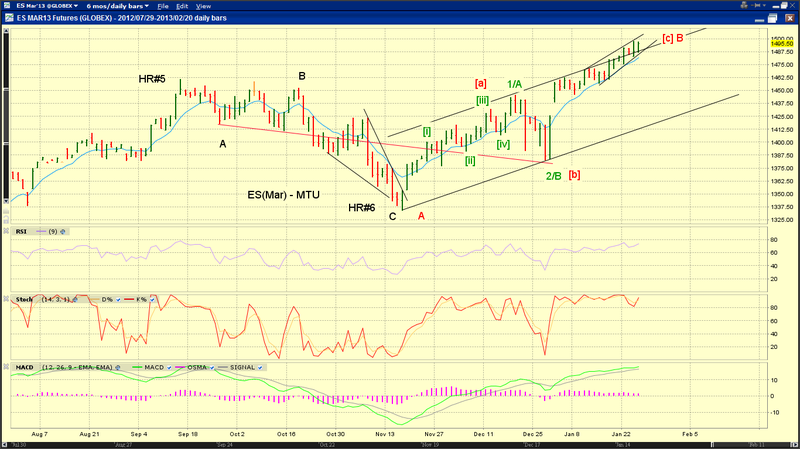 [red] Wave (Y) off the November low if the proposed final upswing of the Hope Rally is a three wave structure. Hope Rally ends. [black] Wave B-up of a flat-like structure dating back to the September high. 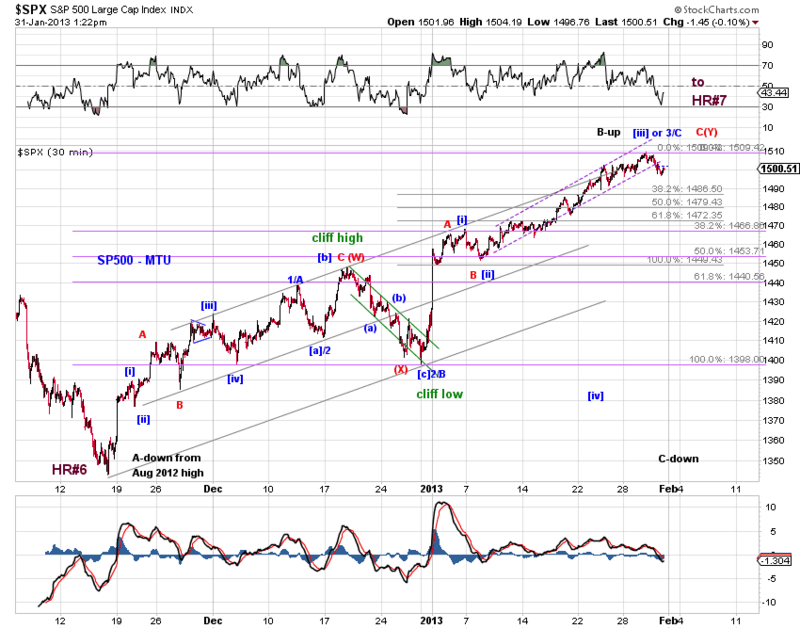 Wave C-down is next to complete point 6 of our Hope Rally model. 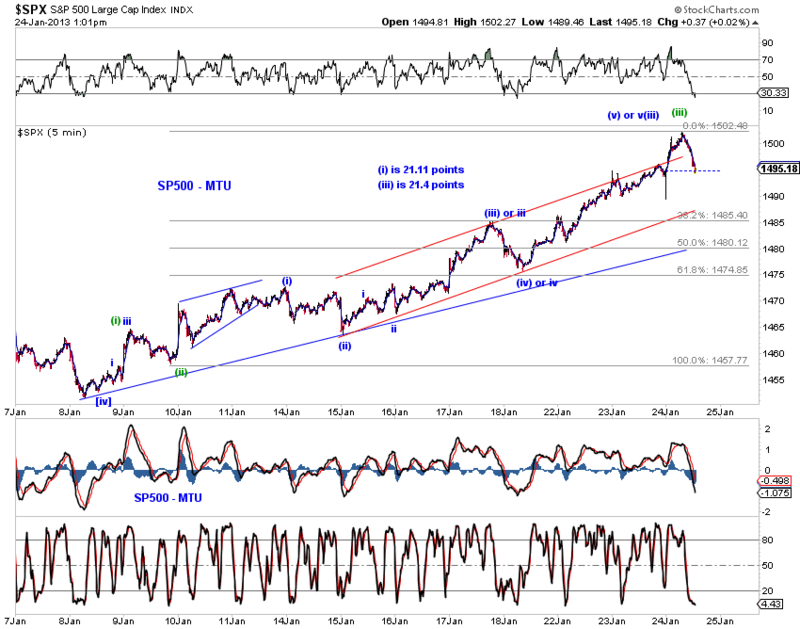 Please see Downside Risks Increasing (1/18/13) for details. With this past week’s subdivision higher, the market is indeed another step closer to the next downswing. 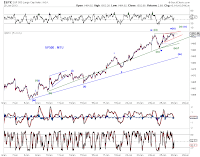 The squiggle counts in Chart 2 suggest that the relatively “weaker” advance since the Jan 8th low is either concluding (green primary) or anticipating the final down-up subdivision (green-alt, blue). 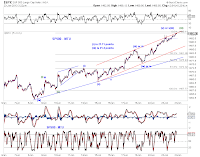 Note that both of these near term scenarios suggest limited net upside potential from current levels, as far as the upswing since the Jan 8th low is concerned. 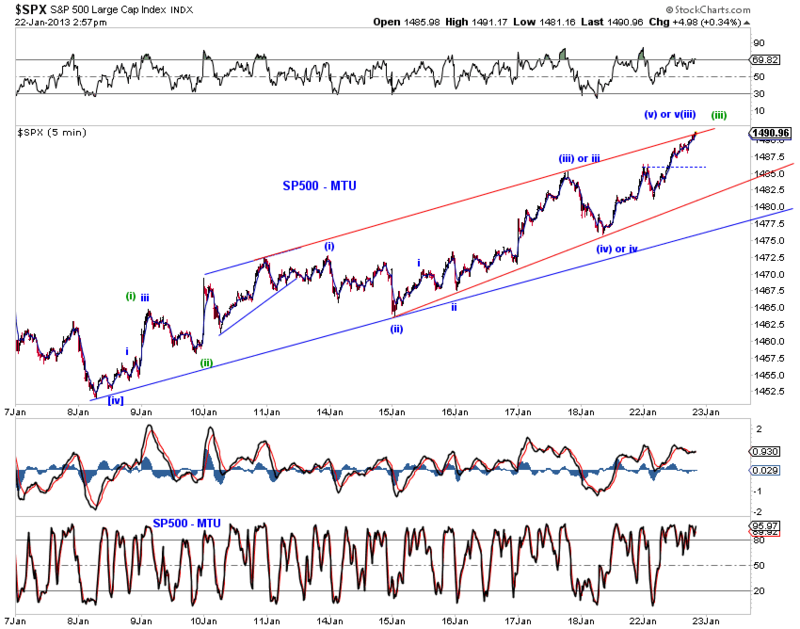 There’s a cluster of support around 1435-1440 area in SP500. Based on our wave counts, this potential support is best interpreted as the target area for either the initial sell-off of the next major downswing or wave [ii]-down of bullish wave 3-up. 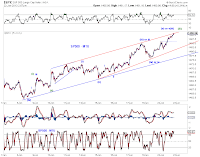 At this stage, the proposed Hope Rally presents some interesting features regarding its price patterns and wave structures. 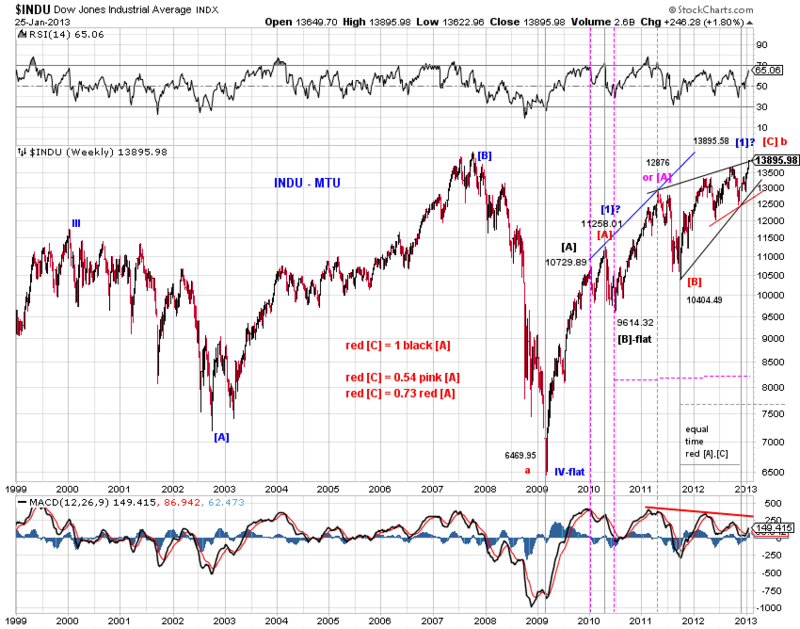 See Chart 3 which focuses on the Dow. 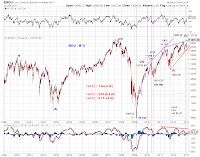 Our primary bearish count interprets the rebound from the 2009 low to date as wave b-up of a multi-year bear market which started at the Y2K top (Chart 3, red). 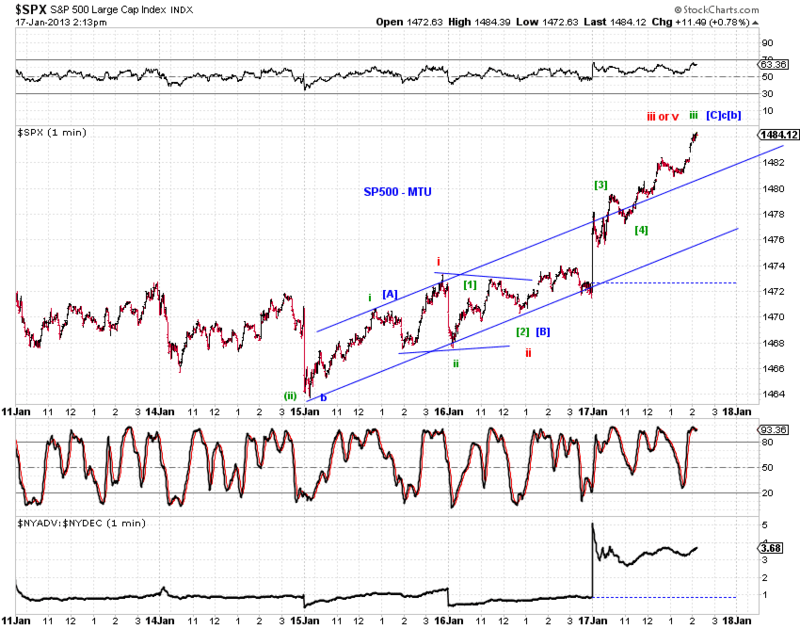 This wave b-up is dubbed “the Hope Rally.” Wave c-down is likely to follow after a triple-top. simple and intuitive with [A] being a simple zigzag, [B] a flat, [C] a giant ending diagonal triangle. 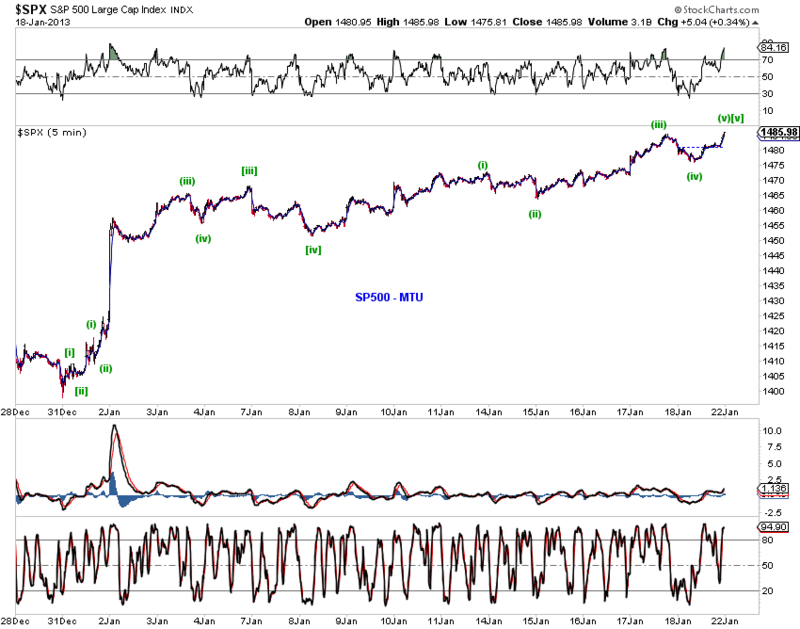 equal size with [C] = 1.005 [A] in index points and [C] about 2/3 x [A] in percentage points (returns) as of Friday’s high. multiple duration with [C] about 3 times [A] in time. 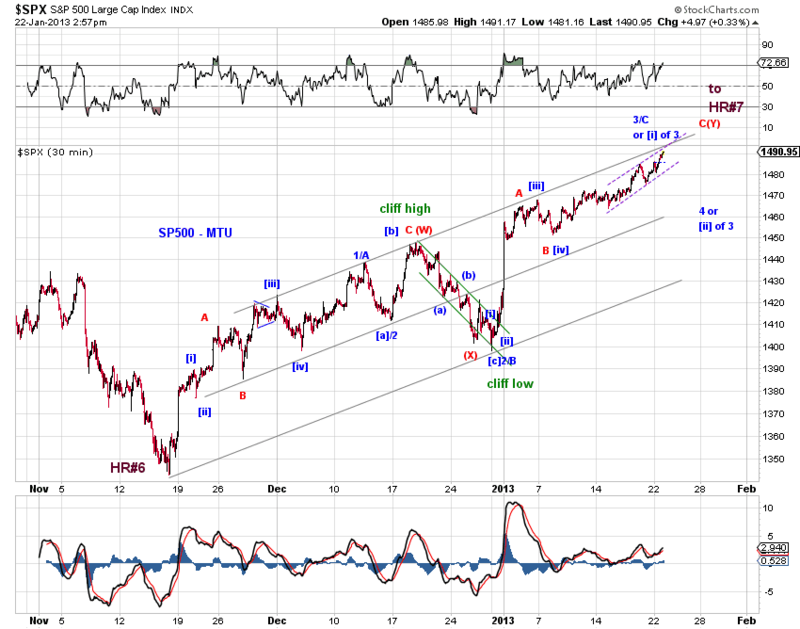 Our alternative bullish count would label the entire Hope Rally as a stack of first and second waves or a leading-diagonal-like first wave which is now approaching its end. 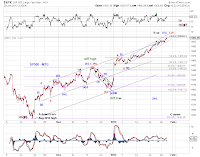 The first count of a series of 1s and 2s does not have the "right look" at the moment and the second count of a leading diagonal structure suggests a deep wave-two pullback which would be in sync with the bearish count on an intermediate term horizon. 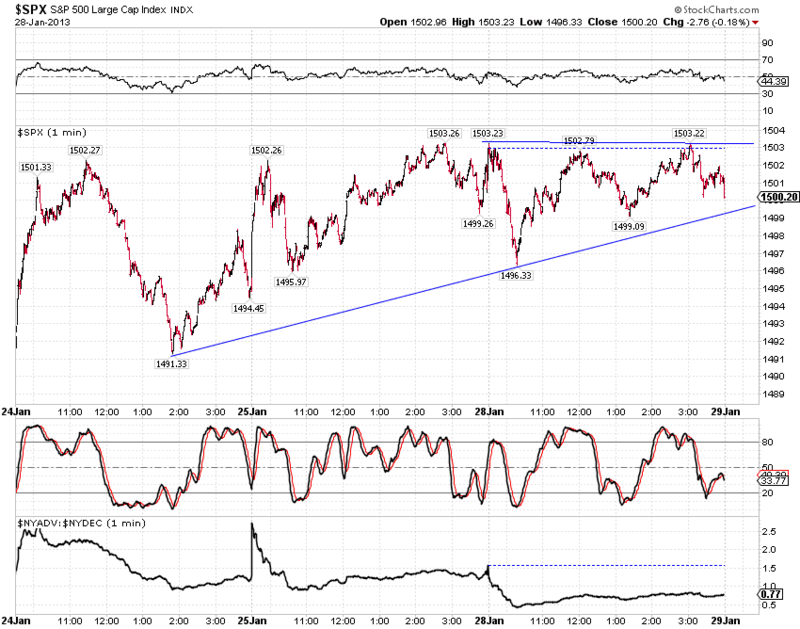 Chart 1 - The red support line has held so far. 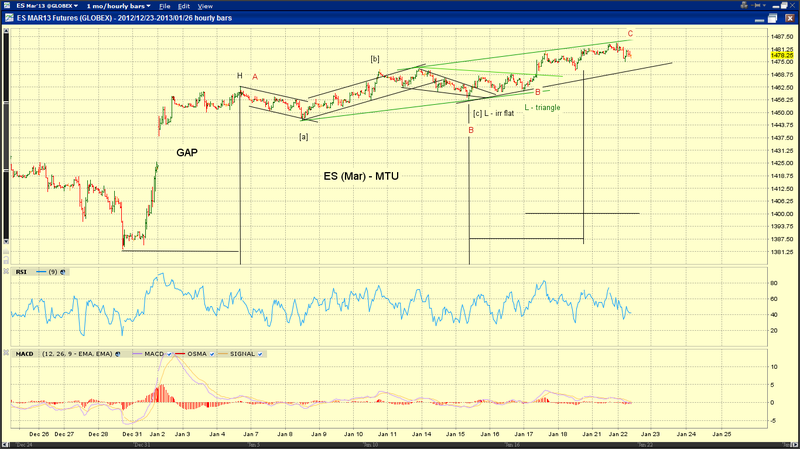 Monitor for a breach for potential confirmation of the next down swing. 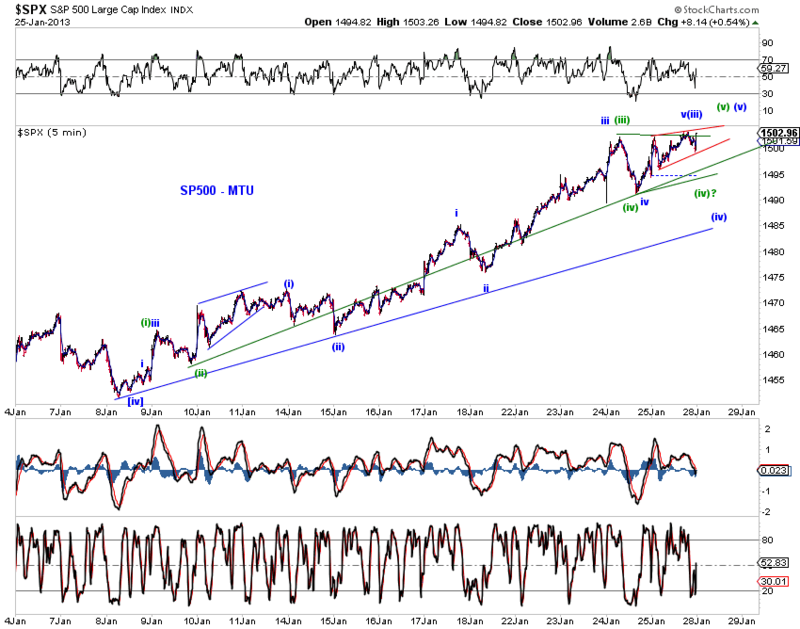 Wave-wise, the overnight low counts well as a 4 wave (green or red (off the 2nd B-traingle, not shown) or a small-degree 4th wave/D wave of an expanded EDT (for the green 3 or red C). 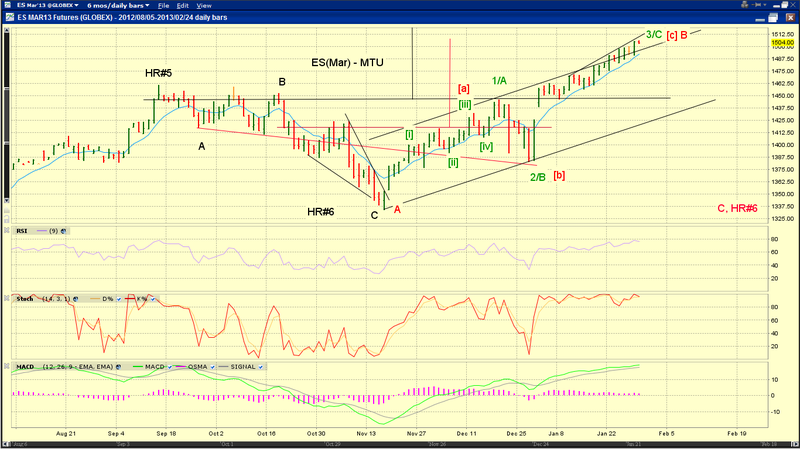 Chart 2 - Daily chart. 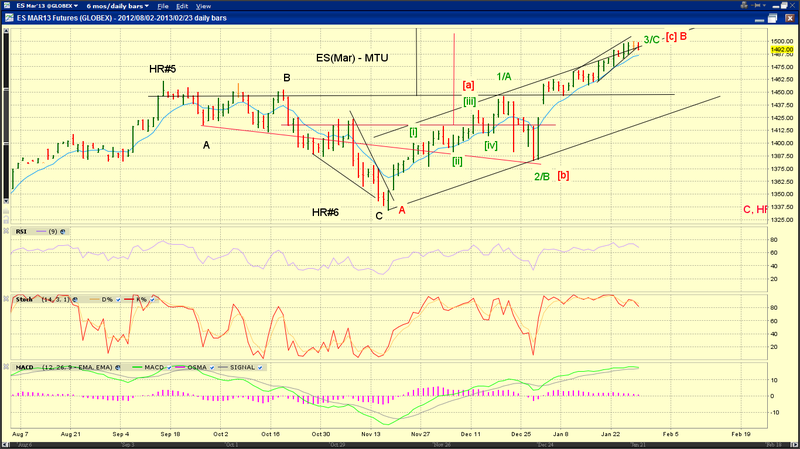 ES is attempting to breakout of the base channel. ES has retested it twice on squiggles so far. updated squiggle counts and tracking counts as discussed in recent days. see charts. 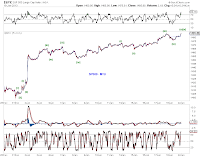 bearish read count - C vs. A, 1/2x in size, 2x in time. 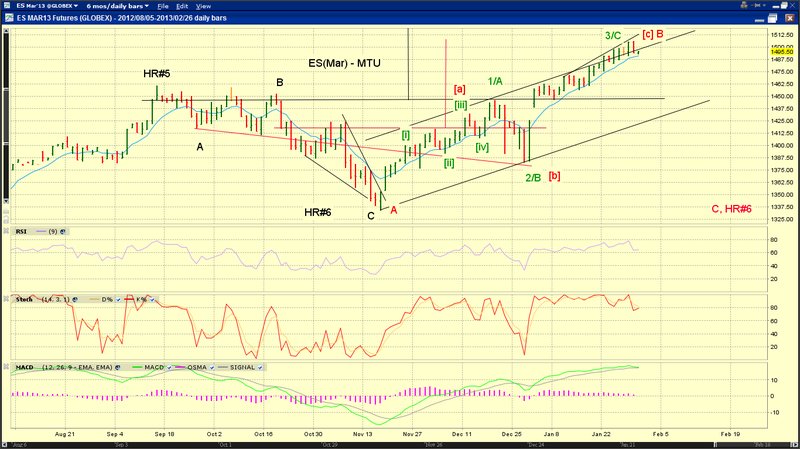 Monitor a breach of the red trendline as potential confirmation. See chart. 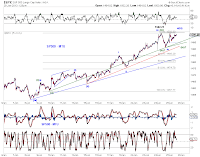 Both the blue and green squiggle counts highlighted yesterday are still in the running (Chart 1) as the proposed blue (iii) is a fraction of a point longer than the proposed blue (i). There's no change the larger tracking count either (Chart 2). The red C is currently about twice in time and half in magnitude with respect to the red A in ES. See chart. Larger tracking count (chart 1) and squiggle count (chart 2). Pending high is likely to be C, [i] of 3, or 3. 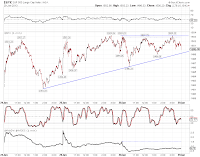 See Downside Risks Increasing (1/18/13) for discussions. 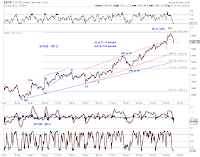 The proposed small-degree pullback (1/11/13) in stocks, while still on the table (Chart 1, blue-alt, green), most likely went sideways (Chart 1, blue, red). 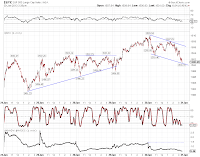 Instead, stocks have been subdividing and crawling higher over the past week pushing SP500 up 0.95%. 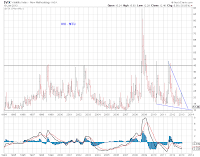 In light of waning momentum, VIX approaching its pre-crisis lows (Chart 2) and price-structures completing, risks of a near term pullback, but more importantly/interestingly, a larger-degree pullback or a trend reversal have increased significantly. We discuss these down-side risks below. 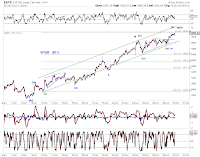 As Chart 3 illustrates, it is possible to count the rise in SP500 since the “cliff-low” as an odd-shaped five-wave advance. 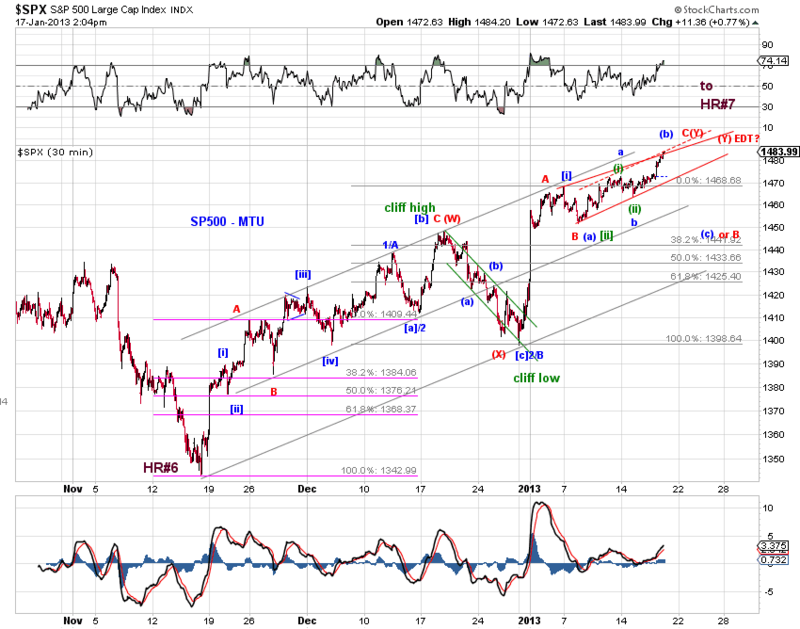 We should count it as wave C, wave [i] of 3 or wave 3 off the November low (Chart 1, green). 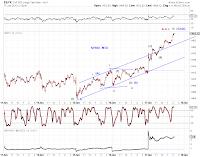 Under this interpretation, a pullback as wave [ii] of 3 or wave 4 is imminent. 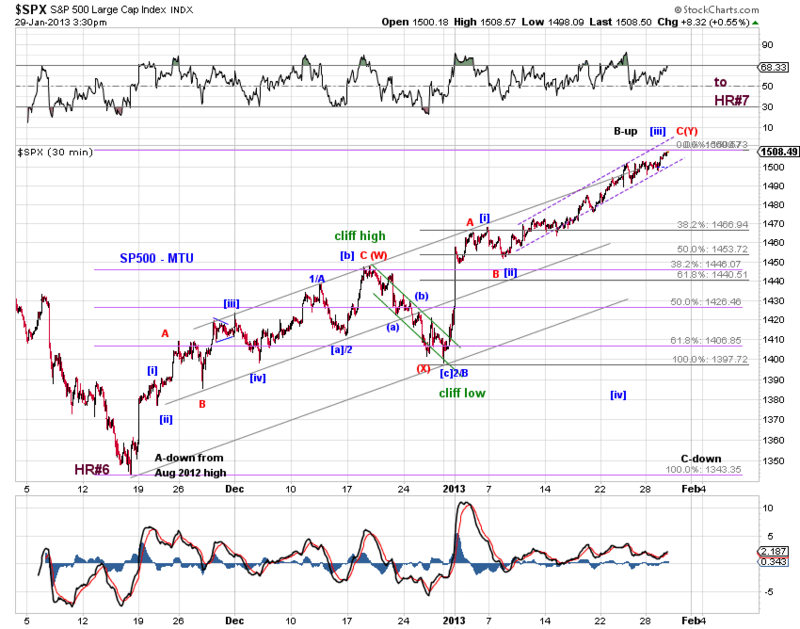 An initial target is around the 1460 area for wave 4 and the 1440 area for wave [ii] of 3. 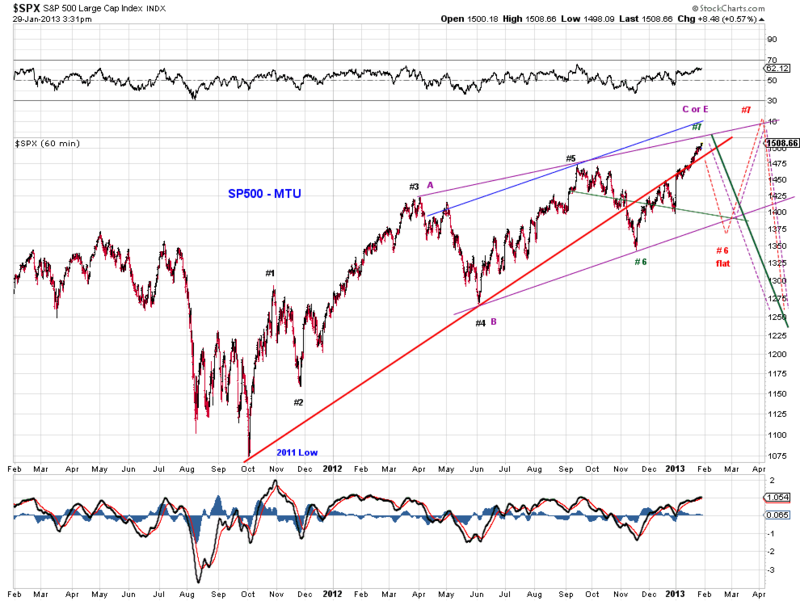 Also note that despite the advance in recent months and a new recovery high, price still sits within the base channel. 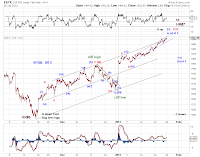 As discussed above, the advance since the November low is so far three waves contained within the base channel and accompanied by waning momentum. 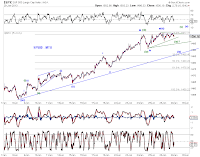 This raised the possibility of a lengthy flat correction dating back to the September high (Chart 4). 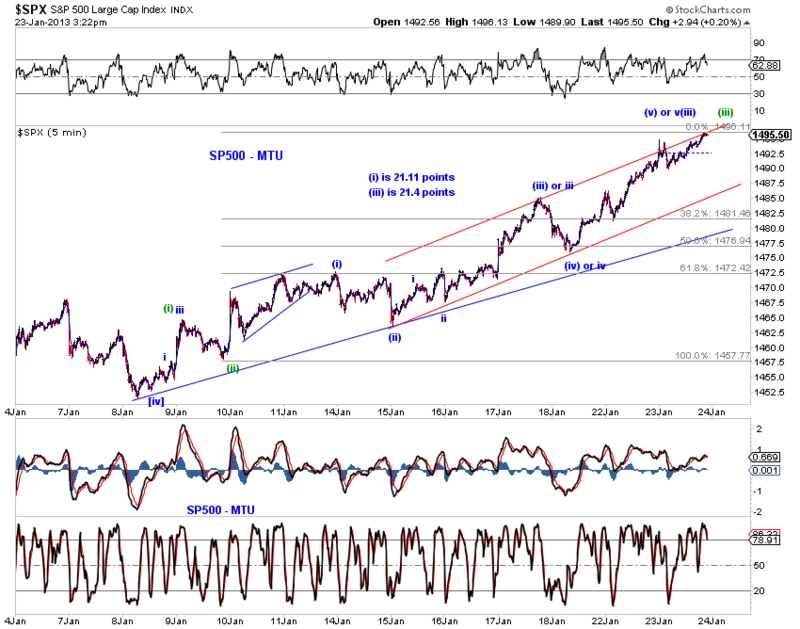 Under this scenario, the September high is point 5 of our Hope Rally model. 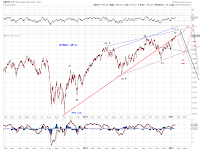 The coming sell-off serves as wave C-down of the proposed flat to reach the red point 6. The subsequent advance to red point 7 will conclude Hope Rally. 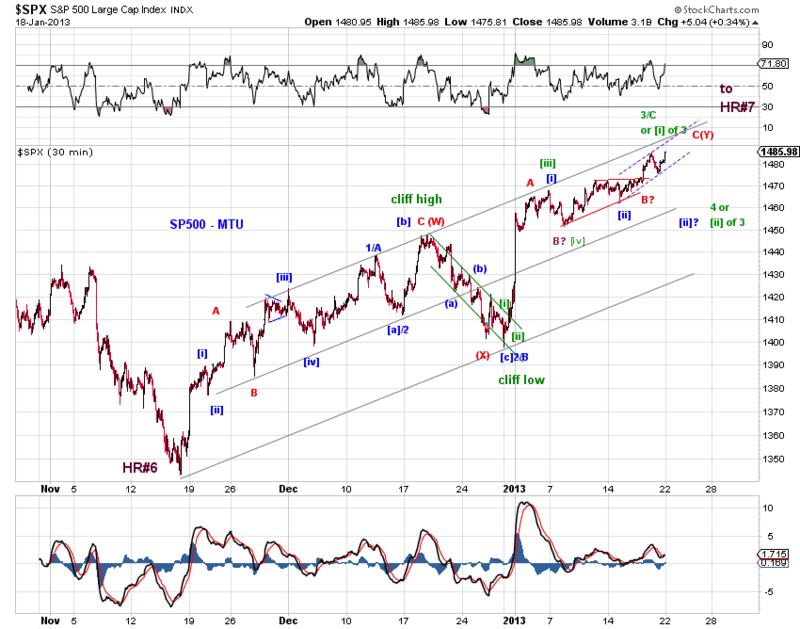 An initial target is around the 1350 area for the proposed sell-off. 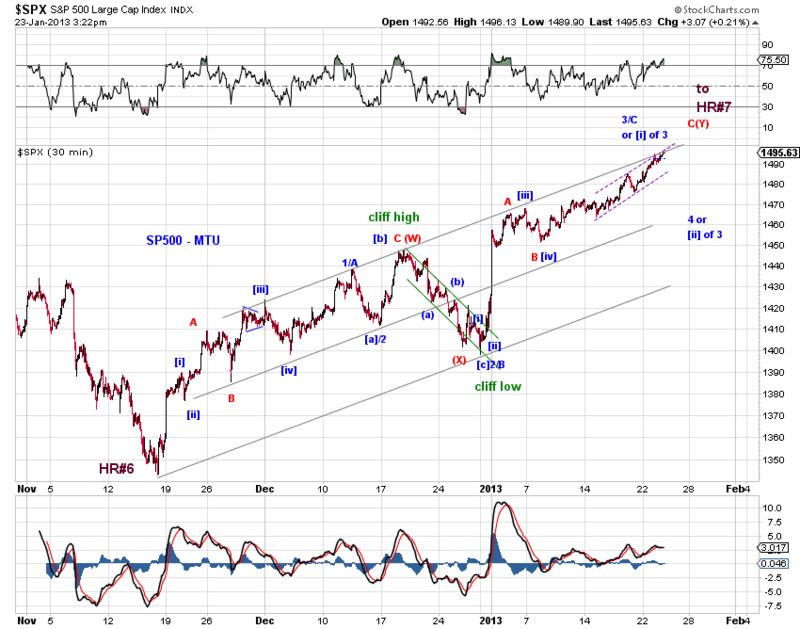 While this scenario is likely to frustrate both bulls and bears, it is nevertheless reasonable, interesting. 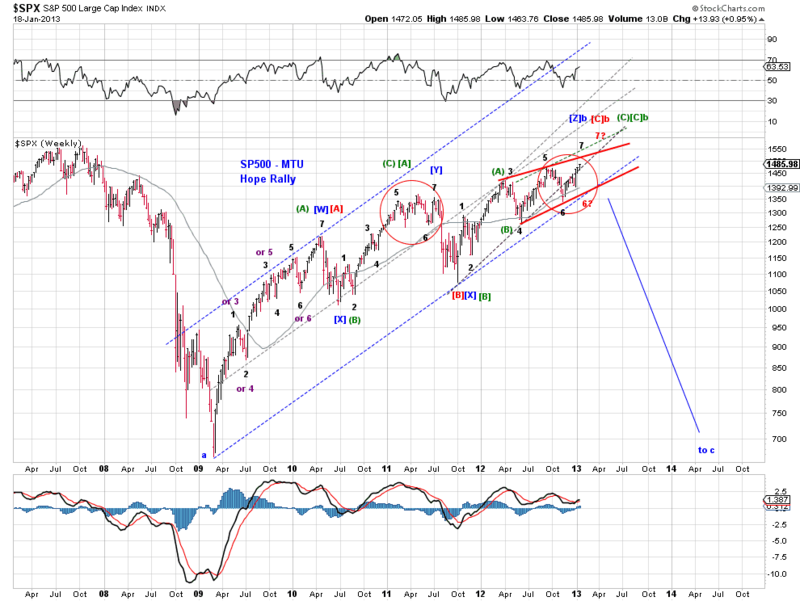 The proposed sell-off may also have a precedent, as the circled areas in Chart 5 illustrate. 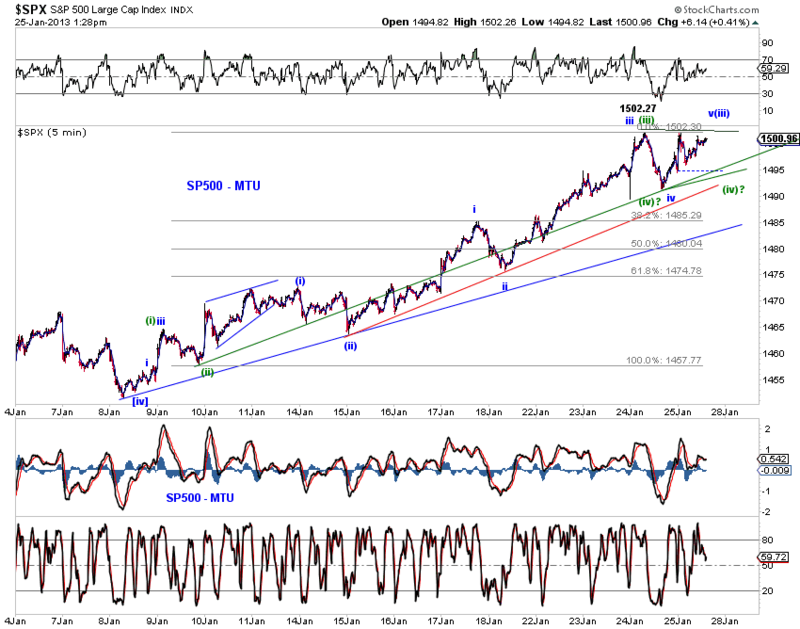 The proposed larger-degree pullback , but not the end of the Hope Rally, can also be wave D of a larger wedge/EDT since the 2011 low (Chart 4, purple). 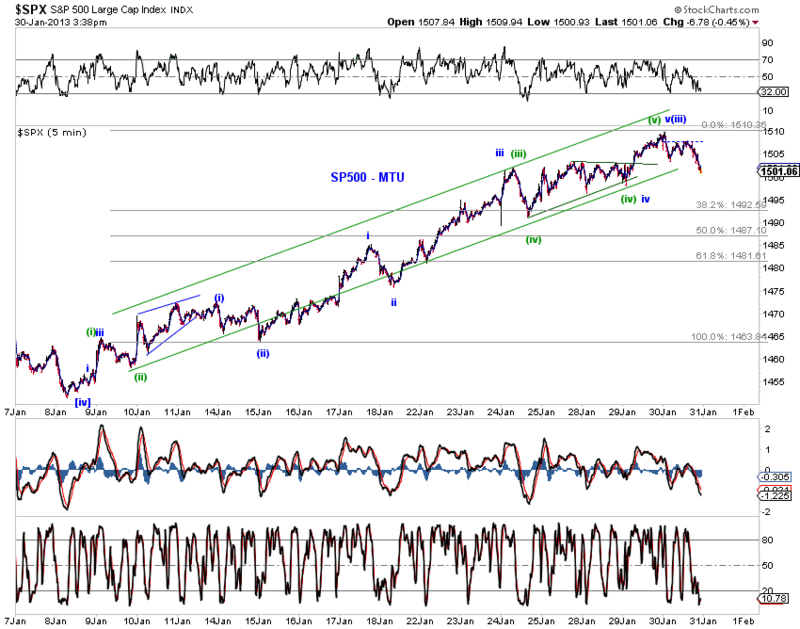 On the other hand, if the November low is indeed black point 6 of our Hope Rally model, stocks are fast approaching the terminal black point 7. 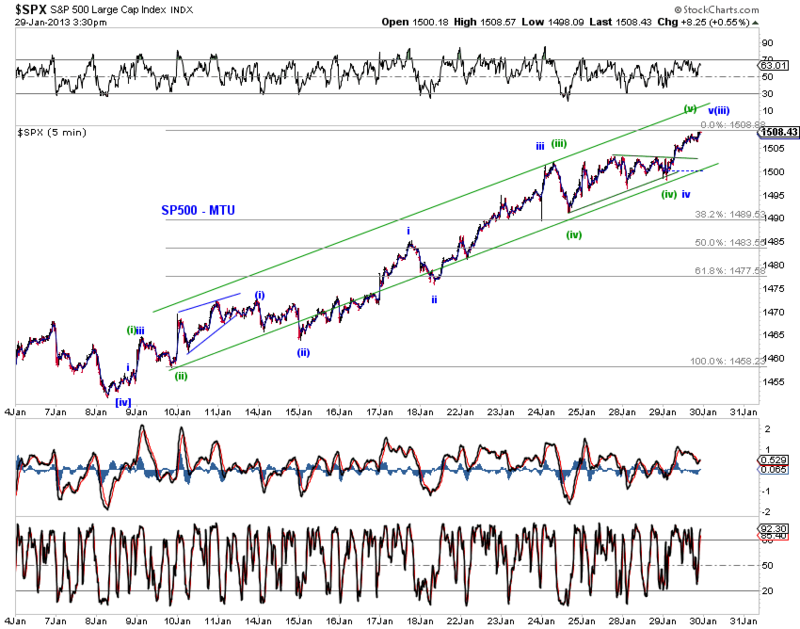 In terms of wave counts, candidates for the pending high under this interpretation are (1) the green and red wave C in Chart 1, (2) the purple wave E of a large wedge/EDT in Chart 4, (3) the green wave 5 (following a wave 4 decline) in Chart 1. 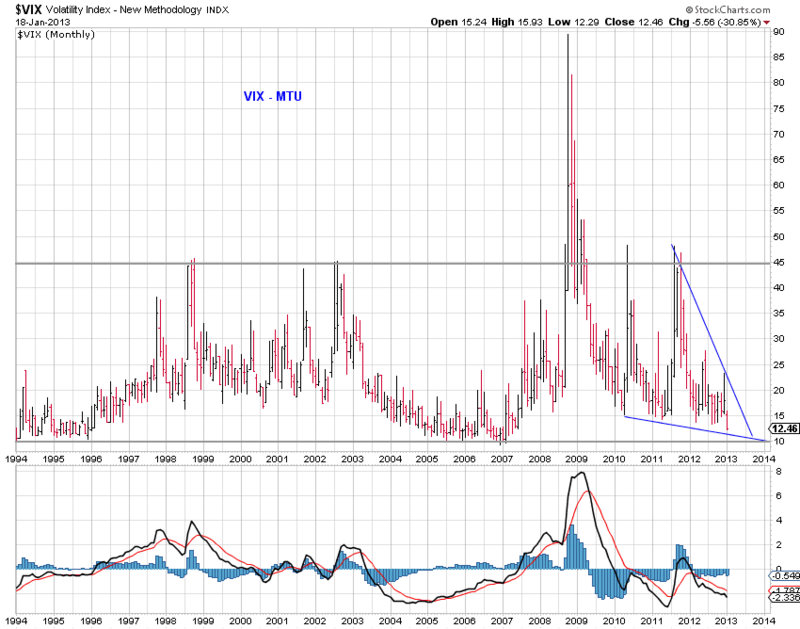 Option (1) and (2) above imply an imminent decline, while option (3) allows for more time, likely measured in weeks. 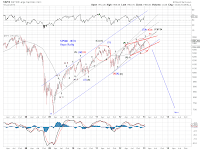 Our analysis would not be complete without a mention of the bullish scenario. 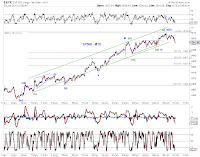 The primary bullish scenario is the green count in Chart 1 where the pending high is wave [i]-up of 3-up. Wave 3 extends to complete its five wave advance. 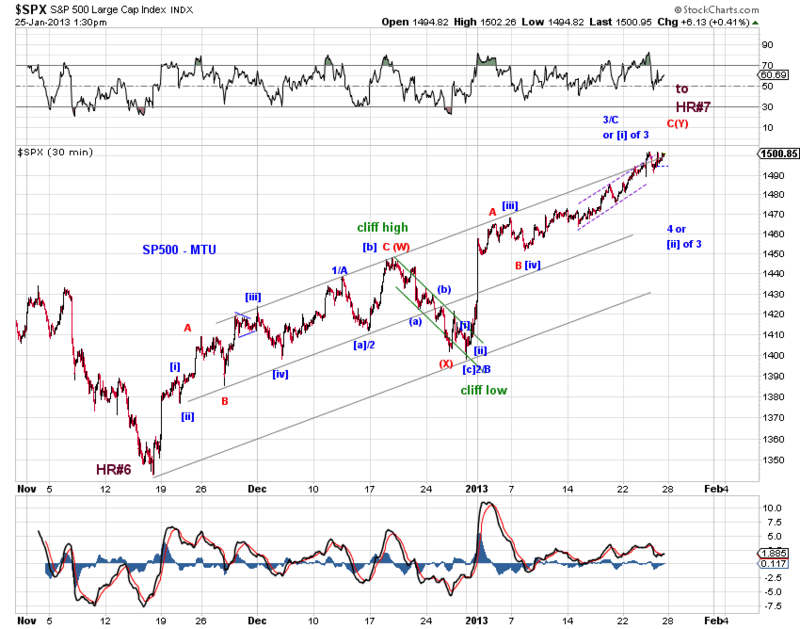 Wave 4-down and Wave 5-up follow to conclude the hope rally. 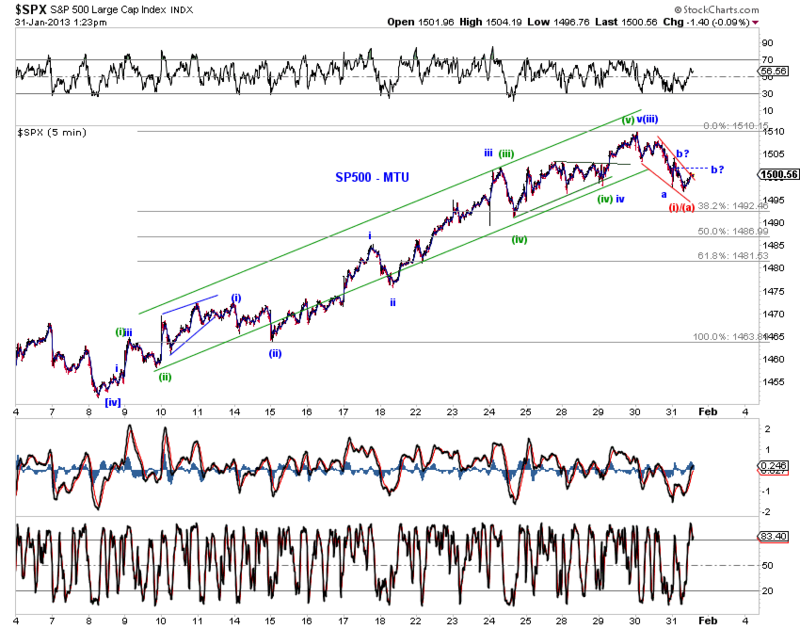 Under this scenario, the end of the Hope Rally is likely months away. 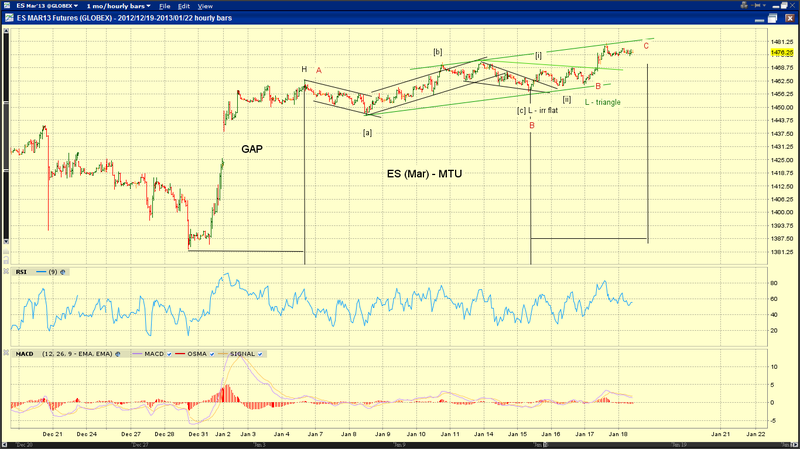 Note the bearish red count where ES is fast approaching equal-time for C with respect to A. See chart. Interesting near term possibilities - Top near term bullish (green) and bearish (blue, red) tracking counts. See charts. 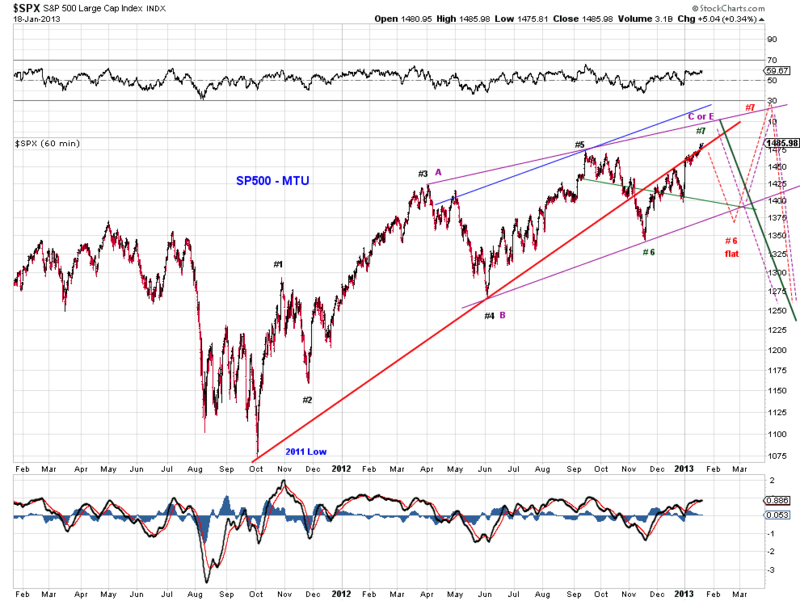 Interesting long term possibilities as well - will outline in the weekend commentary.